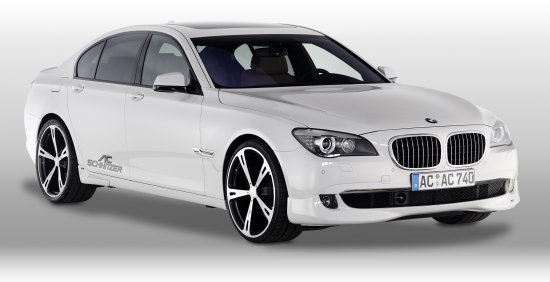 The German BMW tuning house AC Schnitzer have now offerings for the all-new 7-series on stock. The programme includs aerodynamics kit, wheels, lowering springs and twin sports silencer. Engine tuning is in preparation. Schnitzer announces that the 740i's power will increases from 326 to 360hp while the 730d with 245hp are going to put out 286 after reprogramming the ECU. For the interior, a pedal set, some covers and floor mats are gettable. To replace the standard wheels, customers may opt for 20 or 22 inch rims in various width. Those who don't need the larger option can select from a range of three designs. The bigger alloy is available in two shapes – inside the rim! All parts are also offered for the long wheel base model. For this, AC Schnitzer only needs a pair of longer rocker panels. The other parts fit both versions of BMW's flagship. Also the wheels bear enough weight to be used on the extended Seven.